We'll all grow up one day, Meg. We might as well know what we want. 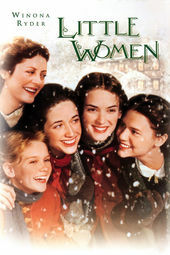 In the opening sequence to Gillian Armstrong’s adaptation of Little Women, ornament and craft lay the foundation for the story of Jo and Beth and Meg and Amy and their home in Concord, Massachusetts. 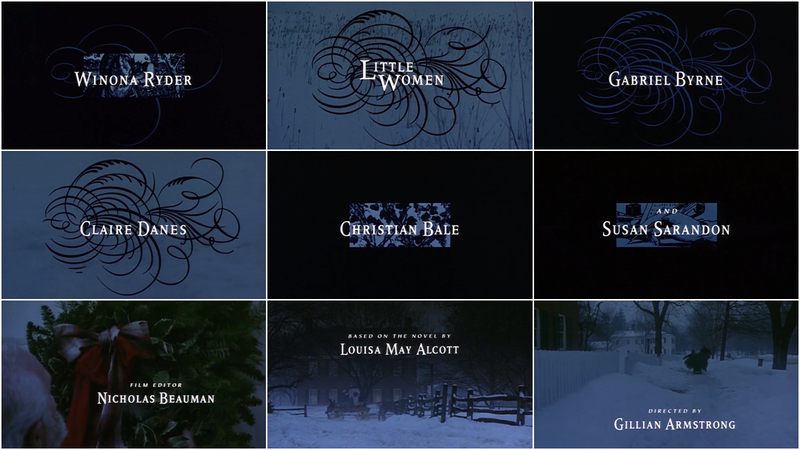 Since the two-volume book was completed by Louisa May Alcott in 1869, there has been a version of Little Women for every generation, including multiple films, TV series, stage shows, and audio dramas. This is the fourth feature film adaptation of the classic novel, and it was released just in time for Christmas in 1994 to much critical acclaim. The title sequence, created by Australian designer Belinda Bennetts, features credits typography set atop woodblock illustrations and calligraphic ornaments, flourishes with graceful curves over fields of snow. The illustrations chosen by Bennetts depict a woman hunched over a book, piles of books, grapevines, and a woman’s hand in the midst of writing, establishing the world of the March sisters. Stories are their solace and their entertainment – read, told, performed and immortalized by Jo, the writer. In his review, the San Francisco Chronicle’s Edward Guthmann called Little Women “one of the rare Hollywood studio films that invites your attention, slowly and elegantly.” From the first moments of the title sequence, the film is imbued with a sense of ease and familiarity. A large part of this is also thanks to the warm and uplifting score by Thomas Newman which Variety reviewer Todd McCarthy called “richly emotional without pandering.” It’s a testament to a perfect pairing of audio and visuals when a sequence of dark shapes in blues and blacks and surrounded by snow can feel so warm.